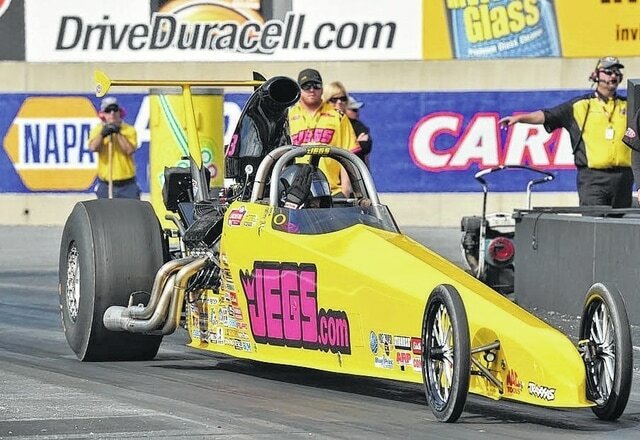 Six-time drag racing world champion Jeg Coughlin Jr. and rising star Troy Coughlin Jr. have three powerful JEGS.com racecars prepared to vie for the $50,000 grand prize at this weekend’s 10th annual Ultimate 64 Shootout at Mountain Park Dragway. Jeg Jr., a 74-time national event winner in NHRA competition, arrives at the picturesque facility in the rolling hills of the Bluegrass State fresh off a big win at the Spring Fling in Bristol, Tenn., where he survived a grueling 10 rounds of action to earn top honors. He’ll once again drive two cars this weekend, a Chevy II wagon and a JEGS.com dragster. His nephew, Troy Jr., who recently turned professional in the NHRA’s Pro Mod class, returns to high dollar bracket racing in a dragster of his own, intent on sharpening his skills and earning a little cash. “Randy Helton and Kelly Estes put on a great event every year and I’m really excited to be going back to Mountain Park Dragway for another fun weekend of racing,” Jeg Jr. said. “That track is just beautiful, a perfect eighth-mile drag strip, and the scenery around there is breathtaking. “Whenever you hold a race with a $50,000 top prize, plus all the daily $10K races, you know all the big guns will be there, I expect every round to be brutal, but that’s the way we like it. Jeg Jr. also expressed his excitement for racing alongside his protégé Troy Jr., who likewise feels honored to pit with his famous uncle. “I always learn so much whenever I spend a racing weekend with Uncle Jeg, especially about being a better driver,” Troy Jr. said. “Him and my dad are my mentors. Family is at the core of our lives and even JEGS.com. A lot of that bond was formed at the races so anytime we get a chance to spend time like this, it’s special. The action is non-stop Friday-Sunday with Ultimate $10K races each day, an $8K 64 Hi-Roller Race Friday, the $50K Ultimate 64 Shootout Saturday and an $8K Ultimate 32 Gambler Race on Sunday.